Cash Camel is a funny online slot from iSoftbet with a friendly camel and a helpful cactus in the lead roles. iSoftbet has been churning out plenty of decent online slots for years but somehow, they never really made it to the main stage. Why? We have no idea. We always enjoy playing iSoftbet slots due to the unique bonus features and the possibility to often win great prices. 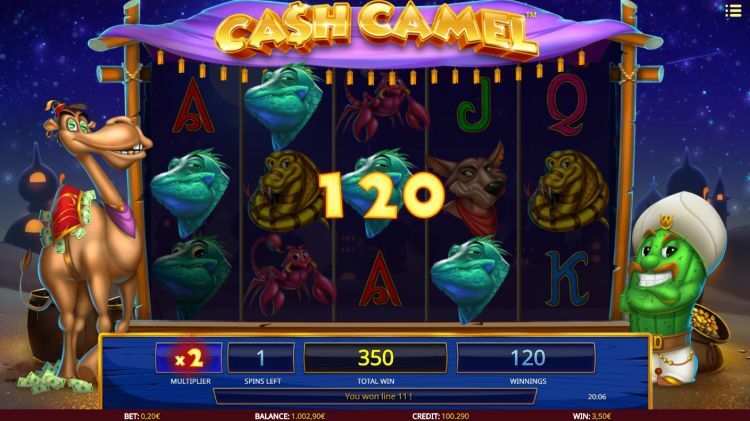 Also, this Cash Camel slot is just a very nice game, albeit not very spectacular online video slot. Typically one of those slots, which is fun enough to spend an occasional $€ 20 or $€ 50 on. 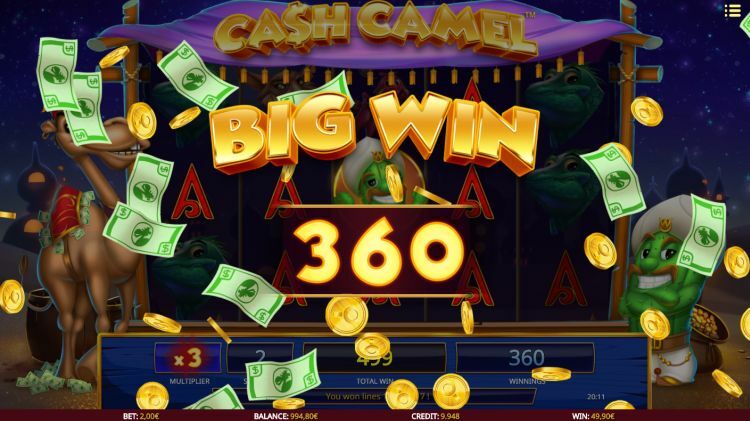 There are two entertaining bonus features in the game and with the extra multipliers and stacked wilds during the free spins you can also bank quite some cash, hence the name: Cash Camel. How does the Cash Camel video slot work? Cash Camel has cartoon-like style and takes us to the hot Sahara desert. Two creatures can survive the desert heat quite easy: the camel and the cactus. This online slot has 5 reels with 3 rows of symbols: the classic video slot arrangement. 20 fixed paylines and betting levels have a coin value between $€ 0.01 and $€ 1. This amounts to a betting range of $€ 0.20 up to $€ 20 per spin. The theoretical payout rate is 95.96%. That is well on par. We estimate the variance to be medium. The cactus symbol is wild and replaces all symbols, except the scatters. The snake is the highest paying symbol. Spin 5 of these cold-blooded reptiles on an active payline, for a 500 coins payout. The tough looking coyote, the shy lizard and the friendly scorpion yield between 150 and 300 coins for a 5-of-a-kind. Finally, we arrive at the low paying symbols: the card symbols. 5 x a 10, J, Q, K or A on a payline awards you between 50 and 100 coins. Spin 3 or more scatters (the camel), and you win a minimum of 10 and a maximum of 30 free spins. But there is more: if a stacked cactus (the wild) appears on the 3rd reel, the multiplier increases by +1. The maximum multiplier is 10. Cactus Bonus: Stacked wild and spin as long as you win. If a stacked Cactus appears on the 3rd reel during the primary game, you win the Cactus Bonus. You can now click on one of the barrels to determine whether you win 5, 7, 8 or 10 free spins. During these free spins the stacked wild stays on reel 3 as sticky wild. Also, you receive a free respin for each winning combination, as long as new winning combinations are created. This is an enjoyable, entertaining video slot with two fun free spins bonuses. The bonus features appear quite frequently. However, this means, unfortunately, the prices you win are not always that high. Later iSoftbet also released the Nutcracker slot, modelled after this Cash Camel game. Where can you find Cash Camel? 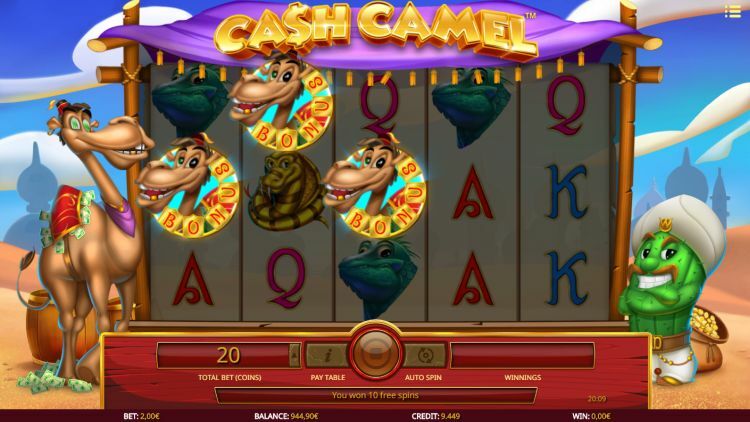 The Cash Camel slot is found at all reliable iSoftbet casinos. One of these iSoftbet casinos is Slots Million, which is one of our favourite online casinos. 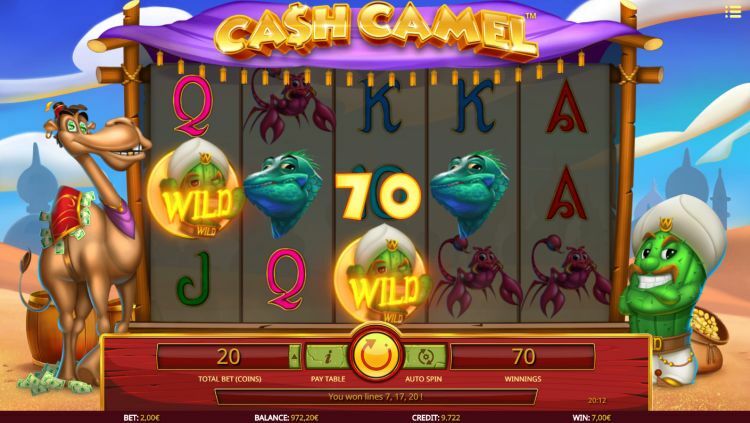 You can play the Cash Camel slot at Slots Million with a 100% bonus up to $€ 100 plus 100 free spins.